Wow, now that's a schnitzel! 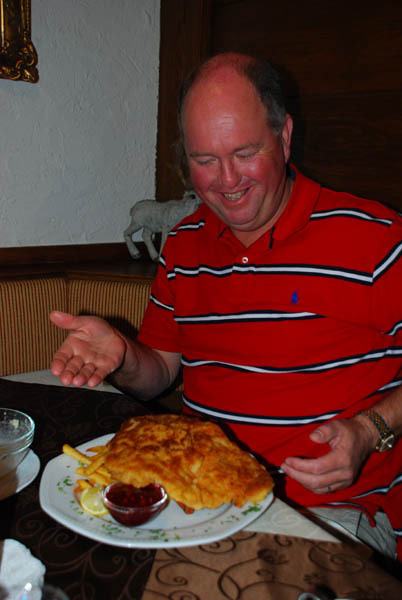 When you’re traveling with a schnitzel lover like Perry Daugherty, it had better be good. So today was a sure-fire crowd pleaser (well, at least for a crowd of one, and that’s Perry) when we stopped in medieval Hall in Tyrol near Innsbruck for our lunch. At a place which will remain a European Focus secret, James knows just what to order for lunch. Perry, the consumate schnitzel fan, dug right in to his plate-sized portion of pounded and breaded pork cutlet. That’s one for the memory banks. Posted in Austria Tours, Europe Tours and tagged austria, europe, greatest, schnitzel.